Suffering – Is it really good for the character? Almost on a daily basis we watch television news and hear about civil war, terrorist activity, or political oppression going on in some part of the world. Atrocities cause immense human suffering whether it be due to the loss of home, community or livelihood, the sudden grief of family bereavement, or a state of terror regarding the possibility of imprisonment and torture. Yet on a personal level are we not all disturbed at some time or other by some disappointment or difficulty even in ordinary civilised life where there is a state of peace? 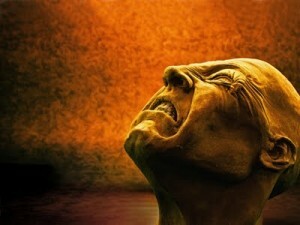 Suffering distress seems like an inevitable part of human existence. Who hasn’t experienced some degree of it? Whether it be as a victim of disease, injury, stress, poverty, unemployment, crime, etc. What is your attitude concerning human suffering? Or perhaps instead you feel that something good comes from human troubles and that every cloud has a silver lining. That for example Angelina Jolie was right to say that “without suffering we would never learn from our mistakes” and that as said by Victor Hugo “It is by suffering that human beings become angels”. Winston Churchill suffered from a lisp being unable to pronounce the letter “S.” He fought to overcome this but never quite succeeded; instead he gradually made it a distinctive part of his oratory, turning a liability to an asset. A much worse form of suffering was the episodes of clinical depression he had throughout his life. He referred to his dark moods as his “Black Dog”. His parents were aristocrats: father a famous politician and mother an American socialite. He did not have a close relationship with them and was largely brought up by nannies and attending boarding schools. We might wonder whether his recurrent depressive episodes heightened his ability to realistically assess the threat that Germany posed? Was it because he had battled illness and despair during his whole life, that he could convey to others that despair could be overcome, even in the bleak period of 1940? His persistence and optimism were able to lift up his nation despite his own suffering. Helen Keller became both blind and deaf after suffering a nearly fatal illness at nineteen months of age. Seemingly sentenced to a life of isolation, Helen made a dramatic breakthrough at the age of six, when she learned to communicate with the help of her teacher, Annie Sullivan. Unlike many disabled people of her era, Helen refused to live in seclusion; instead, she achieved fame as a writer, humanitarian, and social activist. Khalil Gibran is famous for his writing which is full of lyrical outpourings and expresses his deeply religious and mystical nature. But neither was Khalil a stranger to personal suffering. His relationship with his father was difficult and often strained; not surprising as the father was a rough man with a bad temper, who alienated his wife and children. This autocratic, temperamental man was hostile to Kahlil’s artistic nature and was not a loving person. Khalil experienced the social and cultural disruption of exile in America at a very young age when his mother took the children abroad to escape from poverty and feudal corruption. When he was aged nineteen years there was a further family tragedy when his sister, half brother and mother all died of tuberculosis. Further trouble came on his shoulders when aged 27 his lover decided not to marry him because of their race and age difference. Yet his take on suffering was positive. He suffered from failing health in his forties when he died of cancer of the liver. According to the spiritual philosopher Emanuel Swedenborg, pain, distress and other forms of suffering are often useful in obliging us to turn away from complacency, laziness, and self-centredness. It is only through making mistakes that some of us can learn some of the spiritual lessons of life. This all ties in with Swedenborg’s concept of divine permission. According to this idea, it is a mistake to assume that whatever suffering God permits, he must cause. God can be compared to a loving parent who knows that as much as he wants to protect his children at all times, he cannot impose such total control that they are stifled and are not free to develop as individuals. Sadly, when humans make mistakes, which they often do, it means bringing suffering on themselves. The trick of course is to learn from the painful lessons of life. Next Next post: Spiritual awakening – How to discover it?